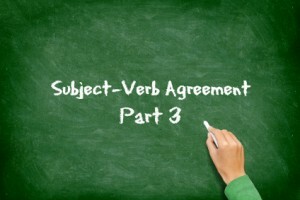 I intended to cover the issue of subject-verb agreement in just two posts, but I have since come across some sentences that pose agreement problems that I haven’t yet addressed. This is, therefore, something of an advanced lesson on the topic. As I covered in Part 1, subjects and their predicates must agree in number. That means singular subjects require singular verbs and plural subjects require plural verbs. English nouns are commonly made plural by adding an s or es to the end of the word, but verbs work the other way around. Singular verbs end in s.
Note that if a verb ends in s in its base form, you add an es to make is singular. So, pass becomes passes, miss becomes misses, and toss becomes tosses. Also note that we are only talking about present tense verbs. There are no distinctions between singular and plural verbs in the simple past or future tenses. The exception is the be, the only verb with differing singular and plural past forms — was and were. Be aware that in verb phrases, only the initial helping verb changes from singular to plural, and only when it is in its present form or the past form of be. So, has gone is singular and have gone is plural; is winning is singular and are winning is plural; and was running is singular and were running is plural. The main verbs — gone, winning, and running — do not change. What we learned in the past two posts is that agreement only becomes a problem when it is difficult to correctly identify the subject of a verb. Few would write something like The cucumber taste funny because the clearly singular subject is immediately followed by the verb. The cucumber tastes funny just sounds right to our ear. But put some words in between and our ear becomes less reliable: The cucumber, not to mention the carrots and green beans, tastes (or is it taste?) funny. Click Here to Check Out WriteAtHome or Enroll Now! Here are the sentence types that cause problems, which I covered in Parts 1 and 2. When I or you is the subject. I eat the same things you eat. There is a pomegranate on your cabinet. Sentence with words between subject and verb. Francis, the kindest of my uncles, loves to fish. Neither Bernie nor the decorators arrive before noon. When the subject is an indefinite pronoun. None of the zebras has a footlocker. The trickiest of all, however, are sentences that involve two or more of the situations above. Below are some examples and my explanations. All my friends and everyone in the class are invited to the party. Here we have a compound subject where both of the subjects are indefinite pronouns followed by prepositional phrases. At first glance, this may look incorrect because you would say Everyone in the class is invited to the party. But the subject of the verb is/are invited is compound here: both all and everyone. And since the conjunction and combines them, it doesn’t matter that the second half of the subject is singular. Together, they make a plural, so the plural verb is required. To our God belong the wisdom, honor, power, and strength. Doesn’t sound right, does it? But it’s technically correct. This sentence is inverted with a compound subject. If God were the subject, the verb would be the singular belongs. But God here is the object of the preposition to and therefore not the subject of the sentence. The subject is once again compound: wisdom, honor, power, and strength. Flip the sentence and you’ll see it: Wisdom, honor, power, and strength belong to our God. Sometimes a singular item is referred to as a compound. This happens a lot with food. Pork and beans, peanut butter and jelly, bacon and eggs are three examples. They are normally treated like a singular dish: Pork and beans is my favorite breakfast. A little peace and quiet is all he was looking for. Thunder and lightning frightens my puppy. Country and western is my least favorite kind of music. Law and order was rare in the Wild West. The news is that Todd and Barbie are engaged. Economics is an important, but often ignored subject. Mumps is a painful illness; so is rickets. There is a another small category of nouns that have no singular form — including scissors, (eye) glasses, pants, shorts, bangs and grits. These words refer to a single item yet both look plural (ending in s) and act plural grammatically. My glasses are in my pocket. Her new bangs look bewitching. All the painting needs is/are some colorful details. The subject here is all, not painting or details. And all is singular unless it’s followed by an of-phrase that shows it is distinctly plural (All of my trousers are blue). In this sentence, all isn’t followed by a prepositional phrase, but by an elliptical adjective clause. The clause is adjectival because it clarifies what is meant by all. It’s elliptical because the word that is left out (You could also say All that the painting needs...). Details here is a predicate nominative, and predicate nominatives do not determine the number of the verb. Thanks to Jacqueline Landis for her explanation of this kind of sentence on Daily Writing Tips. She recommends keeping in mind the song title “All I Want for Christmas Is My Two Front Teeth” when encountering this kind of agreement problem. The song, she says, was written by two teachers who knew their grammar. 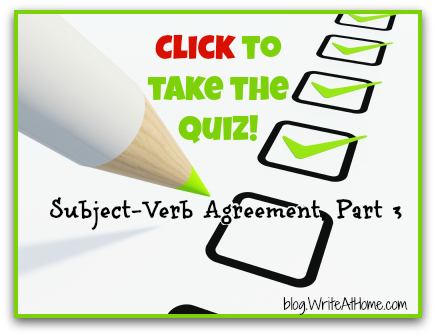 Okay, this post is already too long, and I’ve got a couple more extra-tricky subject-verb agreement situations to cover, so I guess there will be a Part 4! Think you’ve got this stuff down? Take the quiz and find out. Warning–it’s a toughie. Questions? Comments? Hilarious Jokes? Leave them below. Join the conversation. How many people actually phrase their sentences like that? To our God belong the wisdom, honor, power, and strength. Personally, I would never speak that way. That is actually a line from a worship song we sing at my church.